New Delhi: The President of India, Shri Ram NathKovind, reached Santiago, Chile in the evening of March 30, 2019 – the final leg of his visit to three nations – Croatia, Bolivia and Chile. Yesterday (April 1, 2019), the President commenced his engagements with paying his respects at the Monumento Al Libertador General Bernardo O’ Higgins. Thereafter, he visited the ‘La Moneda’ Presidential Palace where he was received by Mr Sebastian Pinera, the President of Chile and accorded a ceremonial welcome. Subsequently, the President led the delegation-level talks between the two sides. Speaking on the occasion, hesaid that India and Chile trade relations are doing well. But the two countries can do much more. Chile is the fifth largest trading partner of India in the Latin American region. Copper constitutes more than 85% of the imports from Chile. We must diversify our trade basket to further strengthen trade. In the subsequent engagement, the President addressed the India-Chile Business Roundtable in Santiago. Speaking on the occasion, he said that for India and for Indian business, Chile is not just a market; it is a very important and long-term partner country. 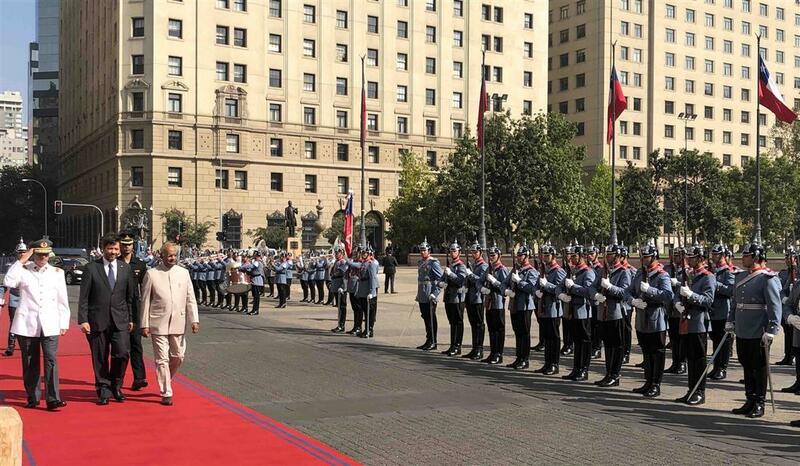 Chile is India’s window to Latin America and to the Pacific Alliance. The President said that the two countries shall work together to expand their trade basket and open new pathways for economic engagement. We can cooperate in areas such as marine research and other scientific exploration, he said. India is also keen to strengthen its collaboration with Chile in the space sector.